Garbage and Thrift – Is It a Load of Trash? Did you ever notice how long it takes you to fill your garbage can? There are many factors involved in what determines how often you need to schlep the thing to the trash out front for the trash collectors to take away, but let’s say you have an average-size garbage can. Do you think it takes you more or less time to fill it than your neighbors? The answer is quite telling, about you, your family and your values. For instance, I have what many who have visited me describe as a "tiny garbage can." So how is it that I create so little garbage and many of my friends and neighborhoods so much? Well, I’ll tell you a story that might help explain it. My husband and I were once invited to a friend’s house for dinner. We arrived a bit early, while my hostess was still preparing some of the dishes for dinner. 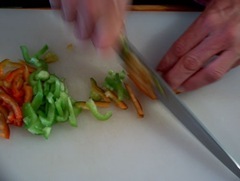 I joined her in the kitchen and we talked together while she was cutting, chopping and stirring. To my great dismay, and even shock (I take this stuff very seriously) she was throwing away all kinds of perfectly edible, yummy parts of the vegetables that she was either too lazy to wash or cut off from the inedible part, or too misguided to realize that she was throwing out valuable food, which she paid good money for. It was all I could do to stop myself from sticking my hands into her trash and recovering perfectly good pieces of red peppers, cucumbers, tomatoes, and who knows what else. I didn’t want to be rude or insult her, so I didn’t say anything to her either. But I was pretty upset and was given an insight into other people’s (bad) habits. I use very little food that come in cans. I always wash aluminum cooking pans until they sprout holes. The ones with holes I use as a bottom for the newer tins, so that they are more stable and last longer. I hardly use tin foil, and almost never use paper plates. It is just the way I am. Some people might call me stingy, or a cheapskate. But I prefer to think of myself as thrifty. I believe that the world today needs a lot more thrifty people, and I hope some of them will find their way here to my new blog, Thrift Deals.